When you think of Key West, what’s the first item on your list of things to do? For many, it’s the Mallory Square Sunset Celebration, where the sun sets and the fun begins! The next item on the list might be dining at great local restaurants. Well a visit to El Meson de Pepe checks both of those items off the list. We’re located inside Mallory Square, and in our opinion, nothing goes better with a sunset than a refreshing mojito and a selection of Cuban tapas. 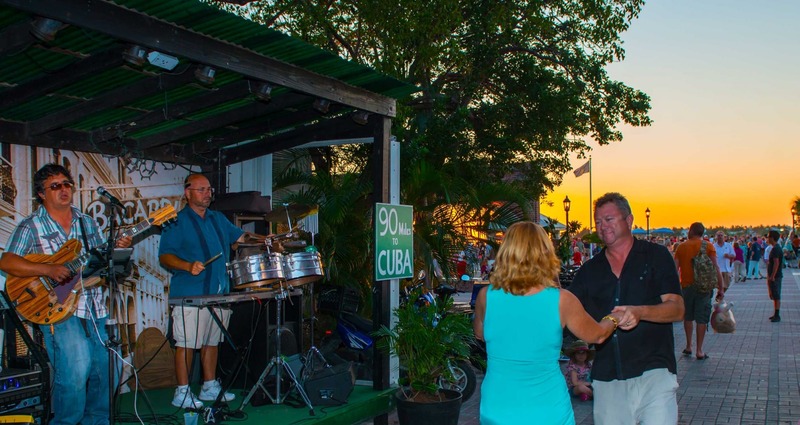 In addition to great libations, every evening just before sunset, we have a live Salsa band for everyone to enjoy. Caribe of Key West is the only local Salsa band on the island and performs a variety of Caribbean favorites! For those who are unfamiliar with the Mallory Square Sunset Celebration, it’s a nightly festival that begins 2 hours before sunset. The celebration includes street performers, magicians, jugglers, local artists and vendors that all come together for an evening that is uniquely Key West. Visitors and locals alike gather to watch one of the most iconic sunsets in the entire world. There are very few places that can experience such a wonderful occasion every evening. El Meson de Pepe is open before, during, and after the celebration offering authentic Cuban dishes and tasty cocktails for everyone to enjoy!